However, there are a lot of different 4×4 cubes and most of them can be used in 4×4 Rubik’s Cube competitions. These 4×4 cubes differ in quality and price. Paying more does not always mean buying a better cube. So, which 4×4 cube should I buy? The best 4×4 cubes are those made by Moyu or ShengShou. These 4×4 cubes are the ones that turns more smoothly, and are the cubes most used in Rubik’s cube competitions. 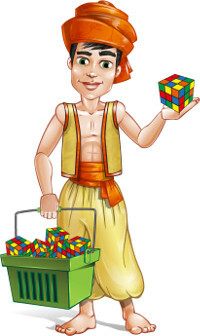 For example, Feliks Zemdegs beat the 4×4 Rubik’s Cube record with a Moyu Weisu, solving the cube in only 24.66 seconds. And their price? They are even cheaper than Rubik’s brand 4×4 cubes. Where can I buy a 4×4 Moyu or 4×4 ShengShou Cube? You won’t find these 4×4 cubes in physical stores, but you can buy them online. You have 2 options. I normally buy in LighTake shop, as I have never had any problem (and I have bought there many times) and they have free shipping worldwide (doesn’t matter what you buy). You can also buy these cubes in Amazon (however, sometimes the prices are higher than in LighTake). Is it safe to buy in LighTake? Yes. I have bought there many time and I have never had any problem with them. That’s why I recommend them. You can use your PayPal account or you can pay with your credit/debit card (MasterCard, Visa, Visa Electron, Maestro, American Express, Discover, Aurora). Yes. They send their products worldwide and you always have the “free shipping” option. How much time does it takes to arrive? If you choose the “free shipping” option (my favorite one), it will arrive in 2-4 weeks. If you are in a hurry, you can choose a quicker non-free option.